In one of my earlier gaming memories, I'm playing Centipede on an old, busted arcade cabinet. Not at an arcade though, but at a doctor's office. I guess it's a bit strange now to think that a doctor's office had a small arcade in it, but at the time it made sense. I remember visiting that particular doctor's office a few times and caring only to play that game. The memory of actually playing the game is faded now. But even as I write this over two decades later, the anticipation I felt before playing it is just as palpable. Even today, few games can elicit such excitement as going to the doctor's office did. The game itself was irrelevant. In fact, the game probably wasn't Centipede. What stuck with me, what caused my Christmas-eve-night eagerness for the next opportunity to visit the Doctor's office, was a leaderboard. Leaderboards can create powerful emotional responses. As for my six-ish year old self, they can create motivation to play a game - regardless of the game. I wanted so bad to play not because the game was fun (it probably was, but I can't even remember the game). I wanted so bad to play because I wanted to see my three initials in that high score screen. I was excited to return because I hoped my name would stay on that list, even they probably unplugged it often and the high scores likely got wiped (but I didn't understood that). Leaderboards provide far more than just motivation. Not all players care to see their name on a global leaderboard, but competition is only one facet. Leaderboards are a visualization of achievement. Their goal is to make comparisons between some player (or item's) ranks. This is a broad statement because implementations of leaderboards can be found not just in arcades, not just in single or multiplayer games, but also in non-games. Reddit.com is a great example of a leaderboard in a non-game context (in other words, gamification). Each post is upvoted, or downvoted into oblivion, and each vote will cause its position on the 'leaderboad' (i.e,. the site) to change. Reddit is a social leaderboard for content. Even if you never post something yourself, you can still affect a post's position. By visualizing data, you give data power. The method of visualizing it shapes how people interpret it and their emotional responses. I'll focus specifically on games, but all the same concepts apply in non-game (i.e., gamification) context. I want to discuss leaderboards from two perspectives: How leaderboards can be visualized and their effect on players. Measuring Progress / Achievement: Leaderboards provides a way to visualize your skill progression. As you become a better player, you get higher scores, and you're able to compare it with past performances. Status: Many players are motivated to keep playing and improving because seeing your name on a leaderboard provides status. Most players feel pretty good when they see they're better than a bunch of other players. Providing a sense of what's possible: In a global, absolute leaderboard, the highest score gives you a sense of what's possible. If you know the best player has 300,000 points and you're 'stuck' at 200,000, you will know it's at least possible to increase your skill to reach that higher score. The caveat here is that if the leaderboard displays cheaters (like pretty much every iOS game center leaderboard I've seen), you completely lose this benefit - and this goes from being a positive to a negative. If the highest score is outside of the realm of possibility, or *everyone* has it, then it's not a realistic measure of potential skill. Leaderboards aren't the only way to visualize achievement of course (badges are another popular method), but they are one of the most effective for encouraging engagement. 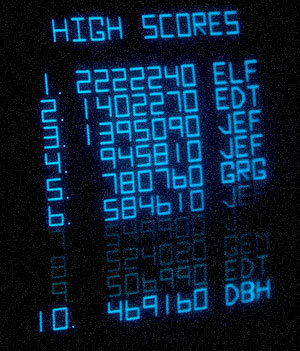 The obvious leaderboard visualization, and a fairly inefficient one in today's games, is the traditional arcade-style high score screen with ten to twenty names listed. For a local arcade cabinet, this can be effective. However, for a persistent, multiplayer game with social components, there are more effective visualizations. Few players will be the top twenty in the world, and not all players are motivated to appear on a global leaderboard. If many people play a game, then of course few people will be in the global top twenty. Many players will even be discouraged because they know they will not (and have no desire) to reach the top tier. For non-local multi-player games, relative leaderboards can be more effective. With relative leaderboards, the leaderboard is centered on you. You can see people above and below you, but the goal isn't necessarily to reach the top. Progress is much easier to see, as you will be able to more easily rise above the people that were ranked higher than you. Another way to present leaderboard information is to group is by geography. This could be based on region (e.g., US or Europe), or at a smaller state, city, or even local level. Maybe it's not realistic to compete against the world, but you'll probably be able to achieve a higher ranking at a city level than you would at a national level (at least, initially). Even if a game is multi-player, it does not necessitate a multi-player leaderboard. A local listing of your own high scores and progress is powerful. Not all players are motivated by the status a public leaderboard provides, but nearly all game players are interested in seeing progress to some degree. By grouping by time, leaderboards can stay fresh. Maybe you couldn't get to the top twenty last week, but perhaps you can this week. If the rankings are changing by time, it can also make the game feel more active. Dedicated players that show up day after day (or week, or month - whatever the interval is) have high status. For instance, on Reddit users that constantly comment and receives a lot of upvotes will often have more of an impact on the conversations than an unknown user. The flip side - and another advantage - is that with a time based ranking system, more players have more chances to show up in the leaderboard. Games like Starcraft and League of Legends (and most other skill-based games) have a ladder system. In it, there are various 'tiers', or 'leagues'. Each tier may have numerous divisions (instances of the tier - for example, there may be 1,000 'Bronze League' divisions which each contain 100 players). The lower tiers usually have a ton, while the final tier may have only a single division. You advance to the next tier by ranking high in your current one. This is a sort of hybrid of a relative and absolute leaderboard. Absolute, in the sense that you may be number 99 out of 100 - but relative in the sense that you're in a 'group' and not compared absolutely to the top tier of players (unless, of course, you're in the top tier). Ladders systems provide a way for players to increase their position in a leaderboard, but do so at a rate that is neither too fast or slow. If you're good, then you'll quickly get to a point where you stop progressing quickly - and if you're bad, you'll drop down in ranks and get to a point where you can rise up by increasing your skill. These aren't the only types of leaderboards. The type that produces perhaps the most motivation are leaderboards that pit groups against each other. For example, teams (or guilds, or clans, or groups in a real world company) that have a ranking. The members of each team want their team to be at the top, and often can be more motivated to be engaged vs. their non-teammed, solo counterparts. Other types in your social graph, how you and your friends compare to each other. There is really a virtually limitless way to slice and categorize the data. Each slicing, each way you present a leaderboard, will change not just how the player perceives their achievements and progress; but will also affect their motivation. By showing friend comparisons, for instance, there is social proof which can be stronger than competing against anonymous players. However, some players are more motivated to improve their own skill and may find local leaderboards that track their individual progress more effective. When you start combining different types of leaderboards, you can create powerful incentives for playing (e.g., grouping by time and location). Allowing sorting can provide another powerful way of exploring the data. Providing too many options, too many leaderboards, is probably a bad idea. However, being cognizant of your game's goals and understanding your game's audience and their goals, providing different types of leaderboards can create incredibly strong impulses to play. In the case of my younger self, the presentation of achivements through leaderboards can be even more powerful than the game itself. 3808 subscribers. The only emails you'll ever see from me are when I publish a new article.